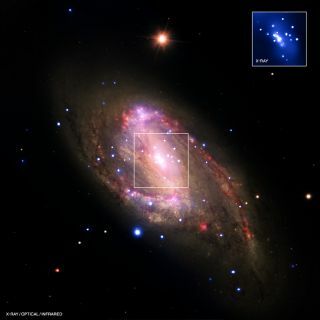 This composite view of NGC 3627 contains X-ray (blue), infrared (red), and optical data (yellow). Meet spiral galaxy NGC 3627. It's located 30 million light years from Earth and it's likely hiding a supermassive black hole at its center, X-ray observations reveal. Researchers say this galaxy is just one example of how X-ray telescopes might help uncover previously unknown, giant black holes right in our cosmic neighborhood. A team of scientists recently looked at data gathered with NASA's Chandra X-ray Observatory from 62 nearby galaxies and showed that 37 of the galaxies have X-ray sources in their centers. Among those, seven are considered new supermassive black hole candidates. X-ray observations can reveal low-level black hole activity that may have been washed out by the bright optical light of the galaxy. The survey, which was detailed last year in The Astrophysical Journal, suggests the fraction of galaxies found to be hosting supermassive black holes is much higher than previously found with optical searches. The composite image of NGC 3627, released last week, combines Chandra data (blue) with infrared data from the Spitzer Space Telescope (red) and optical data from the Hubble Space Telescope and the Very Large Telescope (yellow). It shows the galaxy as it was observed on March 31, 2008.